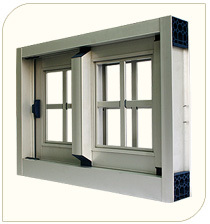 ． The best performance sound and water insulating dual-sliding window on the market. ． Frame thickness is 100mm, suitable for use in luxurious apartment buildings, villas, hotels, and office buildings where a quiet environment is desired. ． Sashes can be removed from inside, a feature that allows easy and safe window cleaning. 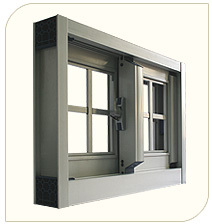 ． Sashes and frame adopt dual-compartment design, providing excellent strength for the window. ． Ladder design on the sill and the bottom sash ensures excellent drainage and prevents water backflow. ． Using 3-point locking handle with airtight hardware. When locked, sash is tightly attached to the weather stripe, reaching high level of water insulation, sound insulation, and air tightness. ． Aluminum or stainless steel tube can be installed on sash to increase anti-theft functionality. ． Sliding doors or larger size sliding windows can use high quality adjustable rollers which can adjust the height of sash to ensure smooth sliding. 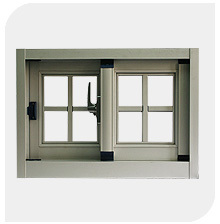 ． Weather stripping between sash and frame for excellent weatherproof capabilities. ． Aluminum or stainless steel tube can be installed on moveable insect screening net to increase anti-theft functionality. ． T9 series can achieve exceptional sound insulation without using the double glazing option. ． Special frame design will cause dew on the interior portion of glass to be drained out.